Tincup is located high in the scenic Rocky Mountains of eastern Gunnison County, near the Gunnison-Chaffee County line in central Colorado. A 19th century prospector returned from the location of this future community with a tin cup filled with gold, thus giving the town its name. 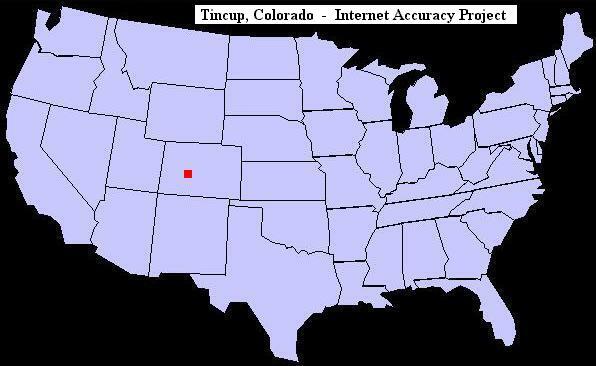 Time Zone: Tincup, Colorado is in the Mountain Time Zone. The region is also home to a large number of ski areas, including the first-rate ski resorts at Aspen and Crested Butte. A trip to the area would be incomplete without a visit to one of the more than two dozen ghost towns that are within an easy drive of Tincup. Camping, boating, kayaking, canoeing, whitewater rafting, windsurfing, hunting, hiking, fishing, ice fishing, ice skating, dog sledding, picnicking, skiing, snowboarding, cross-country skiing, snowshoeing, snowmobiling, mountain biking, backpacking, rock climbing, photography, wildlife viewing, golfing, hot air ballooning, bird watching, ATV riding and horseback riding. Deer, elk, bighorn sheep, bear, bobcat, Ringtail Cat, mountain lion, antelope, moose, coyote, fox, marmot, weasel, rabbit, otter, beaver, mink, skunk, badger, squirrel, chipmunk, turkey, and prairie dog. Anglers will find a variety of fish in area lakes and streams, including Kokanee Salmon, Brook, Brown, Cutthroat, Lake and Rainbow Trout. Birding enthusiasts will find the area provides refuge for the blackbird, chickadee, crane, crow, dove, duck, eagle, falcon, finch, goose, gull, Gunnison Sage-Grouse, hawk, heron, kinglet, lark, magpie, meadowlark, nuthatch, owl, plover, robin, sandpiper, sparrow, starling, swan, swift, thrush, vireo, warbler, woodpecker, and the wren, among others.